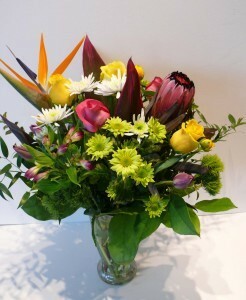 Send this colourful vase arrangement made up of tropical flowers such as Birds of Paradise and Protea combined with beautiful roses and long lasting mums. 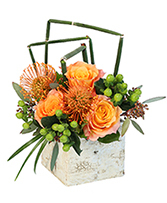 Greens: Salal, Italian Ruscus, Red Ti Leaves, Green Trick, Pink Protea, Green Spray Mums, White Spray Mums, Pink Roses, Yellow Roses, Pink Alstro Filled To Value In A Clear Vase. 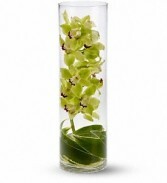 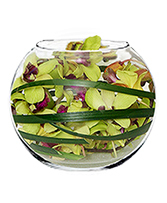 Clear Glass Cylinder Vase, Leaf Wrap, Bloom Cymbidium Spray.